There are popular minerals. Then there’s magnesium. Less than one ounce of our bodies are made up of this crucial mineral. Yet, two-thirds of the world population is deficient in this mineral. That means two-thirds of the world’s population is at risk for chronic disease conditions. What does a magnesium deficiency look like? Imagine the economic impact of a large, important factory closing down in a major industrial city. Multiply that by 300 and you’ve got yourself a magnesium deficiency. 300 important chemical reactions lose a vital factor, an enzyme kick-starter, known as magnesium. Probably the most crucial chemical reaction that magnesium is involved in is our main power plant of cellular energy–the ATP (or adenosine triphosphate) system. What happens when this system goes wrong? Fatigue, confusion, poor learning ability, anxiety, depression, irritability, muscle spasms, or insomnia. If you’ve ever felt a combination of these symptoms, you know what magnesium deficiency feels like. We need magnesium to convert the food we eat into the ATP we use for energy. It gets more serious, as if lower metabolic function weren’t enough. Magnesium regulates heart rhythym, normal blood clotting, nerve function, bone formation, muscle relaxation (and thus exercise performance). When magnesium levels are low, pro-inflammatory molecules thrive and prosper, setting the stage for chronic diseases. The body is under stress. What’s more, this stress reduces the body’s ability to absorb and retain the little magnesium it does get. 300-400 milligrams. That is all the magnesium we need in a day to keep our body running smoothly. Our bodies aren’t asking for too much, now, are they? Of course not. Two aspects of our daily lives, though, make us prone to magnesium deficiency: our diet/lifestyle and environment. If you put forth a concentrated effort to eat a varied, plant-based diet, you probably do not have to worry too much about magnesium levels. If you’re struggling to eat such a diet, your magnesium levels are probably too low. Dark leafy greens like spinach, nuts, seeds, and some whole grains are good sources of magnesium. Keep in mind most of these sources have small amounts of magnesium in them. Therefore, do not rely on a single food for your magnesium foods. Eat a wide variety. Refined, processed foods are, in most cases, stripped of magnesium. Do not allow the fast-moving pace of modern lifestyles to rob you of your magnesium needs. Speaking of fast-paced lifestyles, according to the journal Clinical Cardiology, low magnesium levels are associated with sleep deprivation. Being sleep deprived can leave you prone to magnesium deficiency. If you’re living a fast-paced lifestyle, your chances of being under stress are unquestionably high. Stress, and the numerous hormones involved in it (such as adrenaline), can lead to (mainly urinary) losses of magnesium. Even a healthy lifestyle can cause magnesium depletion. After all, during exercise you are using those energy-producing chemical reactions that require magnesium. If you’re physically active, you are using up the magnesium you consume. 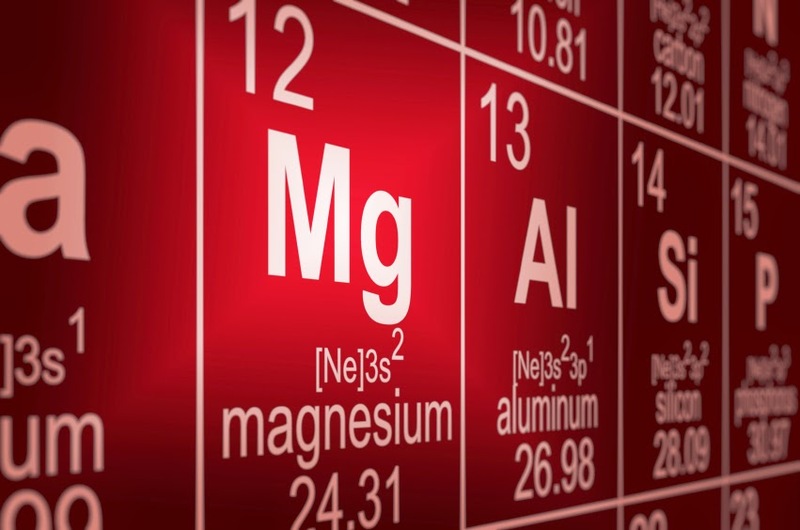 Magnesium is environmentally-friendly. After all, it’s a natural earth element. Plant and animal life depend on it. Photosynthesis, for example, cannot work without the magnesium ion found in the center of chlorophyll. But is the environment magnesium-friendly? Since the start of intensive farming practices, the answer has become “no”. A population of magnesium-deficient people is more likely consuming magnesium-deficient food produced with soil of little mineral value. In the past few decades, these farming practices have left our soil dirt poor. One curious researcher by the name of Dr. E.M. Widdowson and his colleagues have been analyzing soil mineral depletion for decades. Their findings, published in the Nutrition and Health journal, include a 26% drop in magnesium found in vegetables and a 16% drop in fruits in just 60 years. Sure, many of these practices make our fruits and veggies look prettier. These numbers, however, speak for themselves. Fresh produce should not be avoided, however. They are still the ultimate natural and intended source of magnesium for our bodies. Soreness, stiffness, and spasms, oh my! Magnesium can help relax muscles and nerves, including those involved in tension headaches. These benefits also include control of blood vessel spasms associated with hypertension, migraines, and coronary artery disease. What’s more, magnesium can relax spasms of the bronchi, which are involved in asthma attacks, and muscle spasms involved in menstrual cramps. Your workouts will feel different (better! ), too. With normal magnesium to supply those 300+ energy-producing reactions, you can workout with adequate oxygen levels and a normal heart rate. The benefits extend to your nervous system, skeletal system (calcium isn’t the only bone-building nutrient), and endocrine system as well. Hormones such as insulin are affected by magnesium. For example, low magnesium has been shown to worsen insulin resistance, which can contribute to the medical complications of diabetes. A reliable way to get the modest amount of magnesium -a miracle mineral that our body requires is through a mineral supplement or we can say magnesium supplements such as the EnergyOne Men’s Mega Multi and Women’s Mega Multi vitamin + Mineral supplement available in our Supplements store.